In this page, placenames and information from these minorities: Rusyn-Ruthenian in Slovakia, Ukraine and Poland (Lemko); Ukrainian in Poland and Slovakia; and Polish in Ukraine. Orri honetan, honako gutxiengo europarrak ditugu zerrendatuak: Rusyn-Erruteniera Eslovakian, Ukrainan eta Polonian (Lemko herria); Ukrainera Polonian eta Eslovakian; eta Poloniera Ukrainan. The Rusyn or Ruthenians are divided in two areas: The Carpatho-Ruthenia and the Rusyn or Rusinski of former Yugoslavia, a group that apparently speaks Slovak. In the case of the Carpathian groups, we have tables for Slovakia, Ukraine and Poland. Close to Ukrainian, and sometimes not considered a distinct language, Rusyn is written with the cyrillic script. The spellings we display here are doubtful. Rusyn, Ruteniar edo Rusyndarrak bi eskualdetan bizi diraz: Karpato-Rutenian eta Jugoslavia ohian, non Rusyndarrak eslovakieraz mintzo diren. Lehen taldearen kasuan taulak ditugu Eslovakian, Ukrainan eta Polonian bizi diren Rusyndarrentzako. Ukrainieratik gertu dago hizkuntza hau, eta batzuentzat dialektoa besterik ez da. Zirilikoz idazten da, baina gure horrietako transliterazioak ez dira oso fidatzekoak. The Lemko people are the Ruthenian sub-group originary of southeastern Poland. Their population of 178,000 was dispersed after World War II. Now there are some 60,000 Lemkos in Poland, 10,000 living in thier ancestral land. Spellings in this table listing Lemko village are not checked. Lemko herri Erruteniarren azpi-talde bat dira, Poloniako hego-ekialdekoa jatorriz. 178.000 ziren II. Mundu Gerra bukatu zenean, baina orduan indarrez sakabanatu zituzten. Orain 60.000 bat Lemko bizi dira Polonian, horietarik 10.000 inguru beren jatorrizko lurraldean. Zerrendakoak herrixka Lemkotarrak dira. The Carpatho-Ruthenian region covers, the Pressov region in Slovakia. There may be 100.000 members of the Ruthenian ethnic group, but only a third may be speakers. Karpato-Ruteniak Pressov eskualdeak hartzen du Eslovakian, Inguru horretan100.000 rusyndar daude, baina heren bat edo izango dira hiztunak. Regarding spellings take in mind that some special characters are displayed as shown in the table below. Hizkuntza hauek idazteko zenbait zeinu berezi erabiltzen dira; beheko taulari jarraiki adieraziak hemen. The Carpatho Ruthenian region of Ukraine comprises the Transcarpathia and northern Bukovina. The language still lives there, being maybe 200.000 speakers. The Hutsul ethnic group of this region are a sub-group of the Ruthenians. Karpato-Erruteniak hartzen ditu Ukrainaren barruan Transkarpatia deritzon aldea eta Iparraldeko Bukovina delakoa. Hemen 200,000 hiztun izan daitezkeela kalkulatu da. Bertan bizi diren menditarren Hutsul talde etnikoa rusyndarren azpitalde bat dira, bestetik. Before World War II, Poland was geographically located more to the east, occupying lands of what is now Belarus, Lithuania and Ukraine. After borders were redrwan, there were great population movements, but there are still many Poles in the eastern half of Ukraine. There were 1,1 million in the 1979 census. See the other tables from the former Soviet Union. II. Mundu Gerra baino lehen, Polonia geogragikoki ekialderago zegoen, egungo Bielorrusia, Lituania eta Ukrainako lurrak hartzen zituelarik. Mugak mendebalderantzt aldatzean, jende mugimenduak ere izan ziren, baina Ukrainako ekialdean poloniar asko geratu dira, gaur egunera arte. 1979ko erroldan, 1,1 milioi ziren Ukrainan. Around 100,000 Ukrainians live in Slovakia. 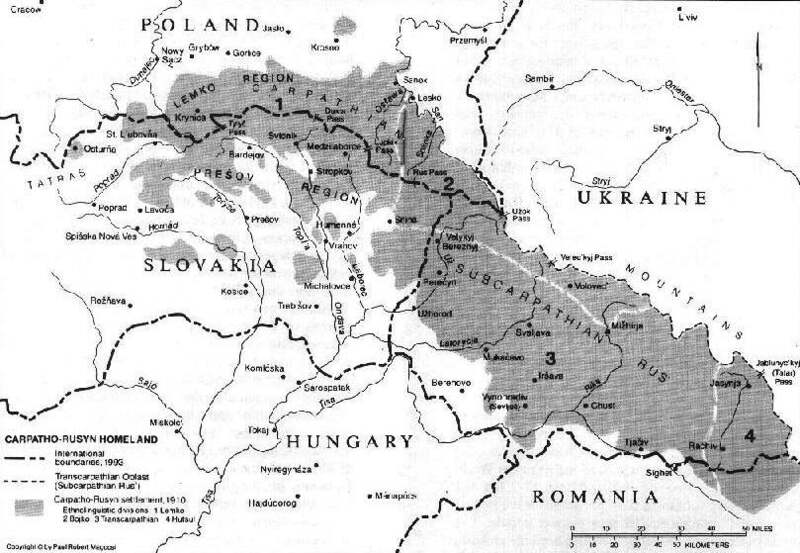 In turn, there are also Slovaks living in Ukraine, in the Transcarpathian region, as this area was even part of Slovakia before World War II. 100.000 ukrainiar inguru bizi da Eslovakian. Era berean, Ukrainian ere eslovakiar asko daude. Izan ere, bi herrialdeen arteko muga (muga sobietarra orduan, noski), II. Mundu Gerra baino lehen, ekialderago zegoen. Stimations of Ukrainians living in Poland range from 300.000 to 1,5 million. They are concentrated in the southeastern regions of the country. Most of these Ukrainians are Greek or Uniate Catholics, and there have been tensions with the Roman Catholic Polish majority around religious issues. Polonian ukrainiar asko bizi da: 300,000tik 1,5 milioira bitarteko kalkuluak eman dira. Hegoekialdeko lurraldeetan daude kokatuak. Erlijioz gehienak uniatoak edo greko-katolikoak dira, eta tentsioak izan dira hori dela eta gehiengo poloniar zeharo katolikoarekin. Slovak: N S C R & Z with Caron; U with Ring above; Y with Acute [as underlined N S C R Z U & Y]. Eslovakieraz: N S C R & Z + Caron; U + Ring above; Y + Acute [hemen azpimarratutako N S C R Z U & Y]. Rusyn: Lists compiled at the http://www.carpatho-rusyn.org website. Ukrainian: Karta Skladena Fabriokoju [map]. Kiev, 1967.